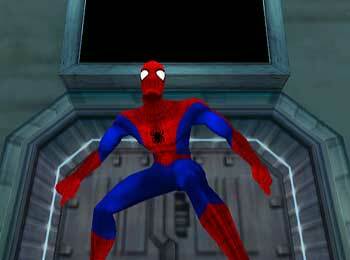 Spider-Man started off many years ago as a comic character from those fine people at Marvel. They made our days of youth such fun. Soon, it started to spawn (forgive the pun) a cartoon, games, and all sorts of merchandise that outs filthy rich companies in the state that they are now. To tell you the truth, I wasn’t really expecting much from this game. It seemed like, just another tired old game that has taken its story from a classic comic, and was likely to destroy all the rules of that comic. Oh boy, was I wrong. 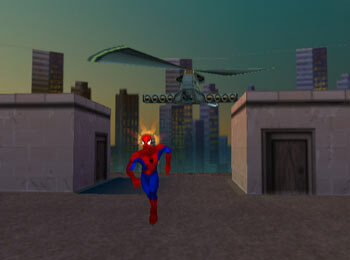 Marvel has had games appearing on consoles for as long as I can remember, ranging from the Atari 2600 to the mega drive, from the Dreamcast to the N64. To be fair, they haven’t had a bad seed as yet! So it was interesting to see that Marvel weren’t actually designing this game! What was going on? Neversoft of Tony Hawks fame were to design it! Could this be? Spider-man doing ollies on a disused school playground? Surely not. Rest assured, not a skateboard in sight on this game! For fans of the comic, the starting movie will be somewhat familiar. The game starts off with a nice opening movie, where Dr. Octopus is giving a lecture at a University about his new technology. As the lecture is drawing to an end, an evil villain dressed as Spider-Man comes onto the stage from nowhere and steals the new technology. Everybody flees except one reporter, Eddie Brock, the human half of Venom. As soon as the game starts, it throws you into the action! You must find out who this other person is, and why they dressed like you? 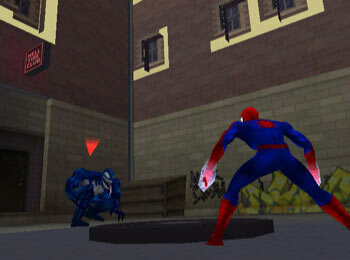 The game revolves around many characters from the Marvel comics. We have appearances from the likes of Captain America, Mysterio, Rhino and Daredevil among some others. This helps the story progress as you get viewpoints from different characters, and they even help you under certain circumstances. The new moves that Spidy has learned are pulled off with excellence. 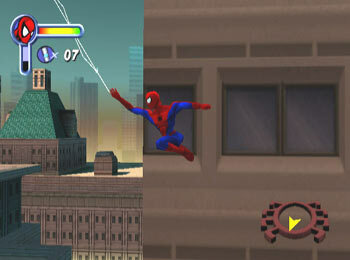 Who could believe that climbing up a building in a Spider suit could be so fun. His silk sling still remains as his main weapon when leaping to and from buildings, but also added are the new stealth tactics. Each stage does seem to be pretty hard I believe, and you’ll spend most of your time on some levels swinging from buildings, or climbing to roofs to find ventilation shafts to enter a building. For this reason, some nice checkpoints have been marked across many levels and you can save your game, just incase something goes wrong and you need to re-try. As I was saying, the new moves which he has learned certainly come in handy when fighting enemies. Except the standard kick, punch and spider web moves, he is able to pull off all new combos, pick up and throw enemies and also use his spiderweb in order to protect himself. For example, he can form a ‘web dome’ around himself as to evade any enemy attacks, and also make ‘web spikes’ which act as spiderweb boxing gloves. The graphics of this game are very well done. Although it is a Playstation port, the developers have made sure that they take advantage of the DC’s huge power. 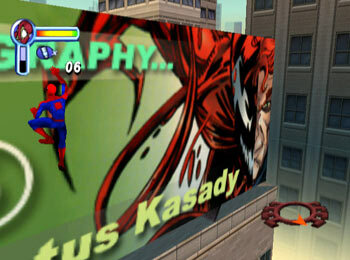 Although it doesn’t make the dreamcast out perform itself, it does however contain some very nice textures, a great frame rate of 30 FPS, excellent lighting effects, and some very strict character details of the other Marvel characters in the game. One thing I really love about this game is that somehow, it manages to be funny in some cases although it is a completely serious ‘to-the-point’ game. After finishing the games on different difficulty settings, you will be able to unlock new items such as costumes, which actually let you do several new moves, etc. You will also be rewarded with comics, storyboards, game overs, and much more. I can’t actually find much to complain about in this game. I have to admit that sometimes the camera angles are slightly strange, and don’t catch up with Spider-Man as fast as should be. Objects that have been left lying around in the game are quite annoying too. For example. You could be just walking along, and then get stuck next to a switch on the floor, or some chains or rope hanging from the ceilings. All in all, this is a tremendous addition to the growing number of ‘comic games’ and it is certainly a great game. 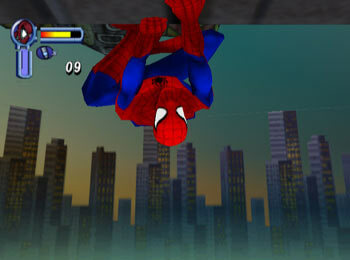 8 Although it is a playstation port, the graphics have been tweaked to suite the Dreamcast's power. very impressive cut scenes. Sound 7 Apart from the occasional funny comment, the sounds aren't really all that great. the music is ok, and sound effects don't have that 'oompth' that some other titles have. Gameplay 8 It puts you in an involving storyline right from the start. what more could you want? Lifespan 8 You'll come back to this just to get extra costumes, comics, and all sorts. "Great fun. certainly some nostalgia in there! brilliant!"